Fortville Police Dept. Chief Bill Knauer wants residents to know he takes their input seriously. Every six months, he conducts a town hall-style meeting to learn what they expect from their police department. The most recent town hall was Dec. 4, 2018. 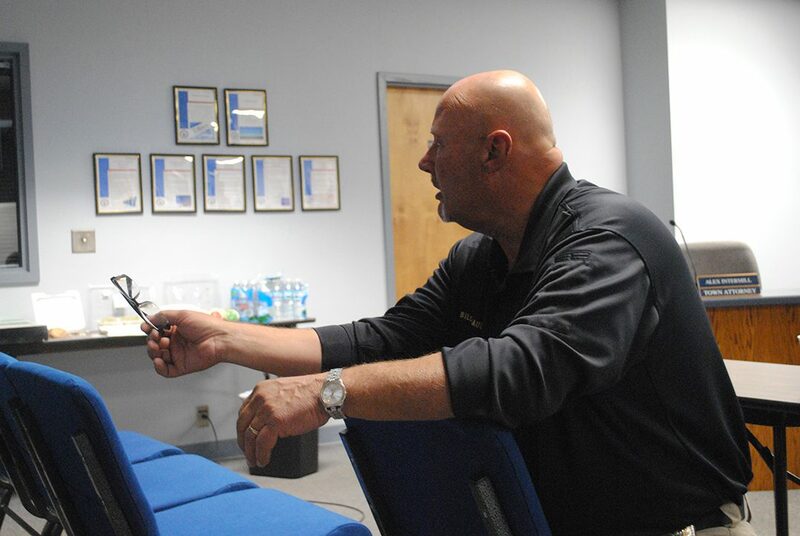 Seated casually, Knauer listened to and addressed the concerns from roughly a dozen people, less than the first town hall meeting held in the summer of 2017. Knauer said he likely will stick to the six-month schedule as long as people are interested in attending. After a town hall Dec. 4, 2018 meeting, Chief Bill Knauer said he would increase patrols at the intersection of Ohio and Leland streets. Town council members Mike Frischkorn and Robert Holland attended the Dec. 4 session. The first topic was the two-way stop intersection at Leland and Ohio streets. “I’ve seen people coming north on Ohio and never even slow down for the stop sign. They just blow right through it at Ohio and Leland,” Fortville resident Dennis Burns said. Knauer listened to Burns. Nearly two months after the meeting, there are still police patrols at the intersection, watching for drivers who may run the stop sign. Burns even offered to allow officers to observe the intersection from his driveway. Frischkorn suggested implementing a yellow “Cross traffic does not stop” yield sign, but Knauer said signs aren’t always the solution. “The problem you have is sometimes the more signs you put up, the less they pay attention,” Knauer said. 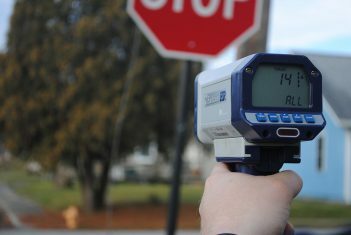 Knauer did, however, submit a grant application in October 2018 for a speed board mounted on a trailer to place at an intersection which will post drivers’ speeds. Knauer anticipates learning whether the FPD will be awarded the grant in February or March. Another resident complimented Knauer and FPD on the police department’s use of Facebook, saying he likes being aware of what the department is doing. Other topics addressed included when the Ind. 13 and Broadway Street intersection will have a stoplight; officer training requirements throughout the year; and the Coffee with a Cop program, which is held approximately each quarter. Chief Bill Knauer addresses residents’ concerns and compliments at a Dec. 4, 2018 town hall meeting. Knauer said he will hold town halls every six months. 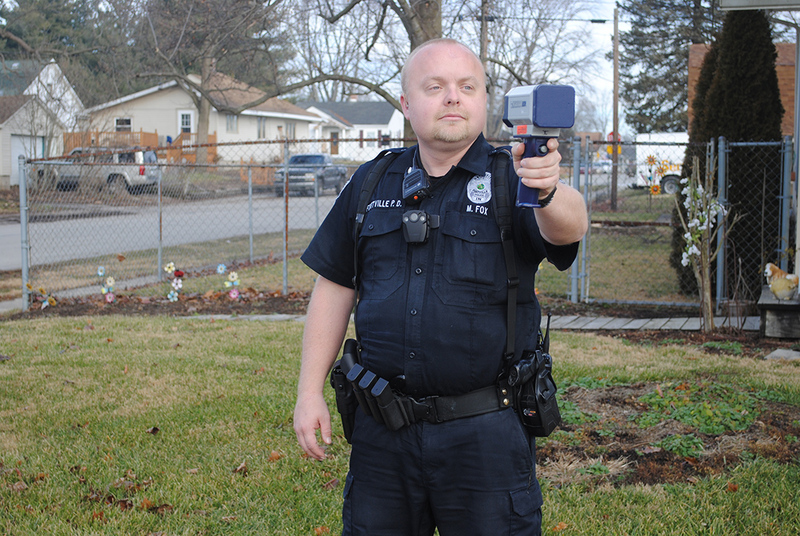 One topic raised during the Dec. 4, 2018 Fortville Police Dept. town hall meeting was the department’s progress in funding a K-9 program. As of the meeting, Chief Bill Knauer said the department was at $12,000 of its $20,000 goal. Typically, approximately $25,000 is needed to launch a K-9 program. The total would fund a kennel at the home, a kennel for the patrol vehicle, a hot dog unit to keep the K-9 cool, an automatic door opener to open the door from the outside of the vehicle and training for the K-9 and the handler. Knauer said somebody has already donated the pad for the home kennel and the kennel has already been obtained, so only a roof is needed for that portion. The Hoosier Kennel Club donated the hot dog unit. Knauer said once the department reaches roughly $20,000 or $21,000, the program can move forward.